Still not cheap when you have it made probably, but looks interesting. If I didn't already make a (I think) nice assembly table with a t track top, I would really think hard about the MFT 3, but I don't think I need it as an assembly table, but really like the possibilities for cutting. Re: Has anyone used the multi function slab? I had a larger version CNC'd locally for my cutting/assembly table that also doubles as my table saw outfeed table. Works great. That is great. The site with the plans says to use 1' MDF. Is that what you used? Doesn't seem easy to get and I am wondering about the weight? I used 3/4" for mine but I don't need to worry about sagging since the table has center supports. If I was going to use it as a portable top, I would go with 1". Your CNC operator/shop should be able to source the 1" MDF fairly easy. I've looked at that too -- a great idea/product -- and moved in a slightly different direction. For now, I don't need the grid of holes, so I just planned on the slab as a cutting and utility surface. The idea for me was to use a strengthened 2'x4' slab of MDF that I built up by sticking down a 1/4" sheet of MDF onto a 1/2" sheet of maple/birch shop grade plywd, and using a pair of 2x4's across the short ends and a single 2x6 down the center long axis; I half-lapped the intersections. I built it this way so that the slab was light enough to manage in remodel situations, sized to be able to lay on the floor for cutting purposes in tight spaces, it is slightly elevated off the floor for comfort, it is very stiff and flat for true cuts even when spanning a pair of saw horses, and I can peel the sacrificial MDF off for replacement when that time comes. What I would differently next: A) Switch to a pair of 2x4's that diagonally span the corners (X pattern) and use the 1/2-lap joint; yes, this is a slightly trickier 1/2-lap to cut, but hey we're woodworkers and it's a single joint instead of 2. B) Alternate "A" solves this issue, but if one prefers the orthogonal stiffeners, then I would hold the end pieces off the slab edge by a couple of inches to allow for edge access for conflict free clamping. I'm thinking of getting one made although I might do my own design. I think 18mm is as thick as you can go to use the Festool clamps? Anyone confirm or deny that? You can ease the underside a bit to make them fit. Several members here have done that. A search would bring up a half dozen posts. In metric that is only about 152mm. I now have about six month use. I use it as a work table that I can put away within my shop. I do not transport it. 1" MDF is too heavy making it difficult to move. I had to relieve the dog holes at least 1.4 inch to use Festool Clamps but thinner stock would eliminate this step. I did round the hand holes to good advantage. The design for using standard clamps is a plus. I would add a hose slot at both ends. Bottom line is I would discourage use of 1" MDF particularly if you were transporting. I get good use of the tool shelf. I would have that made. With sacrificial 1/4 inch top. I don't know about you but wrestling about 90 lbs is not the easiest contest to enter. A one inch MDF is about 121.69 lbs so that is where I am and that piece is a back breaker. This is weight of 1/2 inch sheet to show you the challenge of the weight. I would go at least 3/4 but you can see that the weight of MDF is way above all alternatives. I did not finish, stain or treat my slab. 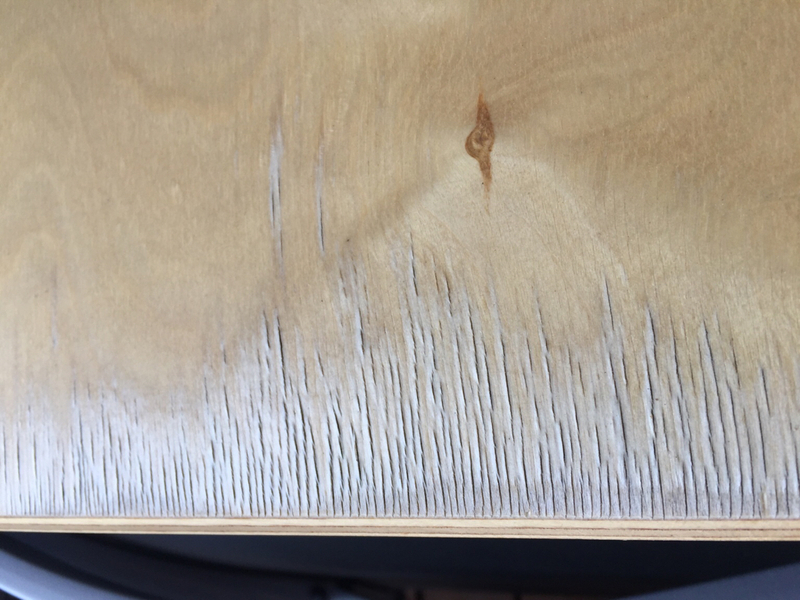 If using a MDF alternate, you may want to varnish or finish before drilling. Relative weights of a 1/2 Sheet For comparison only. Just notice that you are from Missoula. I live in Big Arm, north of you. I am still trying to decide if this is the way I should go. At my age there is no way I could man handle 1" MDF, so an alternative would be necessary. I checked up here and the two cabinet shops in Polson with CNC do not want to do such a thing. Maybe I can contact you for more information if that is okay with you. Phone 406-721-4747. They told me they would be willing to make another. Discuss alternatives to the 1" MDF. They have the input made from my plan so there is no set-up design time. You will need to purchase the plan because it is copyrighted but Ironwood already have the CAD converted to their CNC. You just need to give the designer his due. If you want my name and phone just send private e-mail. We should get together. At the time I was making a bench top MFT and I had them CNC that piece that is the surface of my benchtop/Moxon/MFT. My total that included the design work of converting the CAD drawing and making my top was $313.65. Yours will be a lot less because they just will use the plan that is already set up for CNC. I would like to expand on my experience in the interests of full disclosure. After I built my slab, bought clamps and dogs, I was stunned by the effect on my woodworking. One of the first things I did was make a simple jig. That I was able to square it up in the assembly stage so easily, convinced me that this whole methodology was the way to go. I soon sold off my old trusty radial saw to make room and ordered a MFT/3. Once I got the hang of squaring up the track, I entered a whole new world. I now use my slab for assembly and finish work. I have moved over to doing all my cutting on the MFT.3. If I had it to do over again, I would just go with the MFT/3 and skip the slab. Do a search for custom Sysports / Systainer workbenchs here on the forum and you'll see examples of folks with an MFT with the legs folded on top. Also, I don't remember who it was, but someone posted at one point a way that they secured their MFT to a wall so it operated like a Murphy bed almost. I'll bet someone (like @SRSemenza) will remember who it was. Might be an option. Thanks. That wall mount sounds very cool. You will need to purchase the plan because it is copyrighted but Ironwood already have the CAD converted to their CNC. You just need to give the designer his due. If you want my name and phone just send private e-mail. We should get together. At the time I was making a bench top MFT and I had them CNC that piece that is the surface of my benchtop/Moxon/MFT. My total that included the design work of converting the CAD drawing and making my top was $313.65. Yours will be a lot less because they just will use the plan that is already set up for CNC. If you live in Big Arm and have the CAD file, you might check in Kalispell with Distinctive Countertops (flatbed CNC) or Northwest Cabinet Works (point-to-point). If you needed a super-giant MF slab, Plum Creek makes MDF in 5x12 sizes that both of those shops could machine. Just thinking of lifting it gives me a hernia. DC has a great engineer that could probably make you any size or shape MF slab you want. NWCW might be too busy. Maybe more on topic, I'm thinking that an MFT with the legs folded up would take up a really small amount of space stored on edge, probably less than a pair of folding sawhorses. I have moved my share of MDF and industrial PB, so I have been thinking of getting two sheets of 1/8" masonite and gluing them up to a sheet of xps foam sheet and having that machined into an MFT slab. Like a SIPS panel, but maybe with solid wood around the edge. I have moved my share of MDF and industrial PB, so I have been thinking of getting two sheets of 1/8" masonite and gluing them up to a sheet of xps foam sheet and having that machined into an MFT slab. Like a SIPS panel, but maybe with solid wood around the edge. I had a couple made up and added 1/4" spoil boards made up at the same time. The festool clamps wont work without modifying holes (1" is too thick) but they work great with quazdogs. I'm actually surprised more people haven't commented about this. When I saw this idea I HAD to do it. I had my local lumber yard order a 1" 4x8 sheet of mdf for me and I brought it to a local cabinet building shop with a CNC machine. I love this thing! Plain and simple. It is a very versatile table and I find myself using it for a lot more than its intended uses. Cutting with the TS55 is great but clamping. glue ups, dog stops to hold a piece for dominos, and I feel like I haven't really seen its full potential. I have plans to router a t-track into the surface so I can use hold fasts on it. Thought that may work well for ripping down thin filler stock with the ts55. I will comment to its weight. It in no way is the same weight as a full sheet, as its no where near the size. Mine is portable, I take it from job to job, and although it isn't light its also not as heavy as I thought it would be. It is very manageable. If it sits on the horses for a couple days I do notice a very slight sag to it, not anything outrageous. Can be solved by using a few 2x4s of gluing a few 1x pieces of maple underneath on edge. Overall, for less than half the price of a MFT 3 table, I highly recommend that if anyone is seriously looking into this, just get one. one thing I wish I had done was ordered a 10' sheet of mdf so I could get two slabs out of it, split with a friend, would lower the cost. I've used it quite a bit. I ordered 1" Ultralight MDF which makes it very manageable. The only things I don't love are the lack of attachment to the horses( I will fix with t track on the bottom and a couple clamps) and the inability to get a clamp in as designed. Overall its a nice little work table for a budget price. I made my own version and it works great. I made a smaller size than the one they had. mine is 36x48. I used 3/4"
ultra light and it works just fine. Easy to move around and clamp to. I have some Stanley adjustable saw horses so it brings up the height to something comfortable for me. I have 2 made from 3/4" MDF that sit on the small centipede saw horse (2'x4'). We had a couple made by a local CNC shop. Prefinished the 1" mdf before machining, and had 1/4" maple faced MDF spoil boards made with matching machining. Only drawback with the 1" top and 1/4" spoiler: the festool clamps don't quite fit through the holes because of the added thickness. Works great with Quaz dogs though. I have 2 made from 1" MDF. I'm able to keep one in my van all the time for everyday use and the other stays in the trailer for bigger projects. I had the same issue with the festool element clamps not working due to the thickness so my CNC guy made some new knobs for me out of the scrap MDF that was left over. They are the first thing to get setup every morning. I use the 1" slab and 1/4" spoil board and 1/4" hardboard for glue or paint work.. Both have all the cutouts. It sits on some heavy duty adjustable plastic and metal horses which have little anti-slip pads. The table rarely moves around. So far have used Quaz-dawgs and work around the thickness issue with the Festool clamps. Kinda hate to enlarge holes on the bottom so I can flip the top and use the bottom at it wears or sags. Hello, This is my first post here and I'm just getting started with a new technology, so please bare with me as I read up on the basics and learn the dialect. I need to get some sort of track saw bench set up, but do not want to start another "project". The MFSlab looks like a good starter bench to work off of until I can use it to build a more involved workstation. Is there any thing I should consider changing before having it cut, or anything additional instructions to send with the CAD file? I am planning on using this with some combination of Parf and Qwas dogs. I have read that a 1" top is to thick for Festool clamps. Is there an alternative clamp that will work without having to counter boring the bottom of the holes? first post. About to start getting in the "wood business". I am new to that. Thought about buying a MTF-3 but then came across that table. That looks smart to start :-) Ok, found company in Germany that makes lasercut and cnc so should be fine. 1. How thick should the material be to make sure clamps work. I think the original one is only 19mm. Next size would be 21 mm. Would clamps still work and be stable enough? Do not want to get the thing to heavy. 2. Which material would you recommend? Plain MDF? A waterproof version? 3. Seems some people cut in the table, flip the table around when too many cuts. I would not saw that often on it. So do like that or get a second thinner one for protecting the main one? The clamps are designed to just fit in a 19mm top. If you go thicker you need to relieve the holes on the back as the clamps won't fit. Local wood dealer recommended birch multiplex rather than mdf. I think the trouble with multiplex birch would be that it just does not hold up well when used outdoors. Edit: just to explain, this was covered with 3 coats of PU based clear coat, not untreated. I have a cnc and made mine from 3/4 mdf. I love it. @Nick561 yours should be 19 Millimeter if I calculated correctly (3/4 inch). So clamps work without any problems? And - is it still stable enough? Finally - how much does it roughly weight? I originally come from Bavaraia - we would say more than a tray of beer bottles (20x 1/2 Liter, a little less than 20 Kilo)? Last thing - I found so many different saw horses... I would like some stable ones so you could also use a rotex on it (so pressure not only going downwards but also sideways) - and recommended for this? I know this is resurrecting a somewhat dead thread but will be moving forward with this as my first project with some Festool action. Recently started to help my son with his house and realized that dust collection was one of the most challenging aspects of home DIY. Jumped in with both feet for him and me...realized we needed something akin to the MFT/3 but was hesitant to spend the money right away. Anyway have two sheets of 1" MDF coming...should have gotten 3/4" to work with the FT clamps but too late now. BTW...so far quite pleasant to read the various threads with guidance, comments, reviews, and tales of woe. Nice site! If you chamfer the back of the holes with a roundover cutter the festool clamps will fit. Thanks....first step is picking up the MDF on Saturday. Apply some polyurethane to seal things up then drop off the pieces at the CNC shop. I made one a year or more ago out of 3/4" MDF. It's 3' x 5'. I was growing tired of using foam pieces when cutting with the track saw on my workbench. Mine is more along the lines of Peter Parfitt's Track Saw Cutting Station as I only have some of the dog holes drilled, mainly the ones I use for the Parf dogs to align the track and material. I used the Parf Guide system when building it. All the 3mm holes are drilled so if I need more 20mm holes they can be easily added. It was made to be cut into and has kerfs cut in quite a few places. That's its sole purpose - a track saw cutting station. The one feature about the MFS that I did not like was the handle placement. Two handholds on one edge seemed to me to be an awful design decision making it awkward to carry. I opted to place a single handhold in the center of the sheet which allows me to carry the slab under my arm. I don't move it very far other than from its storage location onto the sawhorses, but if I were a contractor carting this thing around that's definitely a better location for a handhold. I use foldable plastic sawhorses available at Lowe's. Seems to do the trick and I've used my router and sanders on this. It's stable enough but nowhere near that of a dedicated workbench. When I need it, I can set it up in under 2 minutes. The one issue I've had with it is warping. I had it set up on the sawhorses at one time for a number of months. I wasn't expecting 3/4" MDF to warp, but it did. I may fix it at some point by routing a sliding dovetail into its length and using a piece of hardwood to try and stiffen it. Thanks Lunchman.....good feedback on the carrying slots...laptop shoulder strap might be a good choice with the original slots. I have made a few MFT slabs using the PARF GUIDE SYSTEM. I had 3 sheets of 4 x 10 MDF, so I cut the first one in half and made my own design for the holes, clamp slots etc., then commenced to the drilling. I found the first one to be an excellent size which allowed me to work on cabinets, cabinet sides, face frames, big glue-ups. 4x5 tops seem to work for me. Most of the time I'm working in a conditioned area so the humidity is low. Nevertheless, I do notice sag when I used the plastic horses. It helps to use the 2 x4's in the slot provided in these horses. Having the 2 x 4 support also gives you a way to temporarily clamp your top down. Just pick 2 really straight ones. Good luck. [emoji38]I use two Bessey clamps and it makes the setup pretty solid. I'm thinking that the next batch of tops I do will have the handhold in the middle, that's a great idea. I might even urethane the tops. At this time I'm using the several pair Store Horse metal horses, of which I have now purchased every grade they make. Be aware that the lower number grades hold less weight and do not have adjustable height. I've bought them at home depot and online, when a deal came up. BTW I use Harbor Freight movers quilts to put over my mdf tops to make a nice soft, scratch free zone for finishing parts and such. It's proven to be a great work area for my intermediate sanding between coats of finish. Just don't try to wash the quilts, they'll just fall apart, and they will deform horribly in the dryer [emoji33] I got several sizes, about 15 of them for 100 bucks. I have been apply the poly to my two sheets and have definitely noticed the need to support the sheets on the sawhorses with 2 by 4s....so far I am not sure I will actually be able to have the sheets CNCed. Running into cost issues so far...waiting on a shop to give me a quote...at least they called me to discuss the job and ask questions. If it ends up being too expensive I will take the UJK route. Will take longer but I have also started to look at the MFS slab drawing with changes I would like, particularly the handhold in the middle. If it ends up being too expensive I will take the UJK route. Will take longer but I have also started to look at the MFS slab drawing with changes I would like, particularly the handhold in the middle. I have one of the UK made Custom Solutions slabs. Its made from 3/4" MDF, has lots of holes, easy enough for any able bodied person to lift and carry about and accurate. Err, it was cheap enough and I generally just put it on a couple of bits of 2x2 across two sawstools. My slabs are done....will pick them up next Monday. Very interested to see how they came out. @clark_fork what size is your MFS? I was going to have one cnc'd but if it's too heavy at the size it was designed I may have to rethink that. 3' x 5" X 1"
Perhaps the 3/4" would be more manageable but the 1" is unmanageable even with the splendid hand hole system. The one inch thickness has an even worse complication. Clamps can't be seated in the hole and each hole has to be routed from the bottom to soften the hole enough to accept the clamp. There is nothing wrong with using thinner stock and adding under battens if need be. Overall, this has been a very good design with the hand holes, hose placement slot and clamp slots. However, I later bought the MFT/3 for cutting and now use this slab mostly for assembly work, squaring, clamping and with a sacrificial top for finishing. I made 1" thick Baltic Birch plywood versions in 2 sizes. Easy to move and rugged as heck. Tongue oil finish. All clamps work in the holes with slight chamfer or roundover. [/quote]I made 1" thick Baltic Birch plywood versions in 2 sizes. Easy to move and rugged as heck. Tongue oil finish. All clamps work in the holes with slight chamfer or roundover. Source? Special order? Cost $$$? Here is where I get my wood and ply, the 18mm 30" x 60" is 28CAD$ zero void. [/quote]Called a local lumber yard and they ordered it in. I am in Jacksonville, Florida and the 5'x5' pieces came from Pennsylvania. Took 4 days to get, was $60 a sheet for the 1" thick Baltic Birch plywood. I agree with clark_fork..1 inch MDF is a bit of challenge to move. Picked up my four pieces from the CNC shop and the tops are pretty heavy. Overall the shop did a nice job for a very fair price. I'm considering using a MF Slab as the top of my outfeed table...what's the ballpark cost to have a CNC shop do the work? I've also found a local guy selling these for $150, but not sure if it'd be cheaper to buy the CAD file and have it made by someone else? Depends on many factors. First to reduce the cost you have to come with your own design file. TSO Product are providing for free a few designs. Once you have the desired file, it's a matter to find a local shop that provide the service. The price may vary but if you are providing material (MDF sheet) it should be between $50-$80 IMO.